Most organisations have started, and many have made significant progress towards digitally transforming their business to improve business and/or operational performance and value creation. The leveraging of modern technology can enable transformation of the business products and services and/or transformation in the ecosystems and value chain that delivers these products and services. The organisations stakeholders especially employees are central to enabling transformation and central to realising the benefits of that transformation, and therefore need to be considered in any program of change. They facilitate the change and are also impacted by the change in their Digital Workplace. In this paper, we consider Business Driven Digital Change and how to maximize the engagement and benefits for key multi-generational stakeholders’ contribution to achieving the organisations performance goals. A Model for transforming the Digital Workplace. In the previous article, we outlined an approach for Leaders and Managers to engage the people in the organisations Digital Agenda, and their Digital Workplace. We looked at the 3 levels of change as it relates to the organisation and also the Individual. 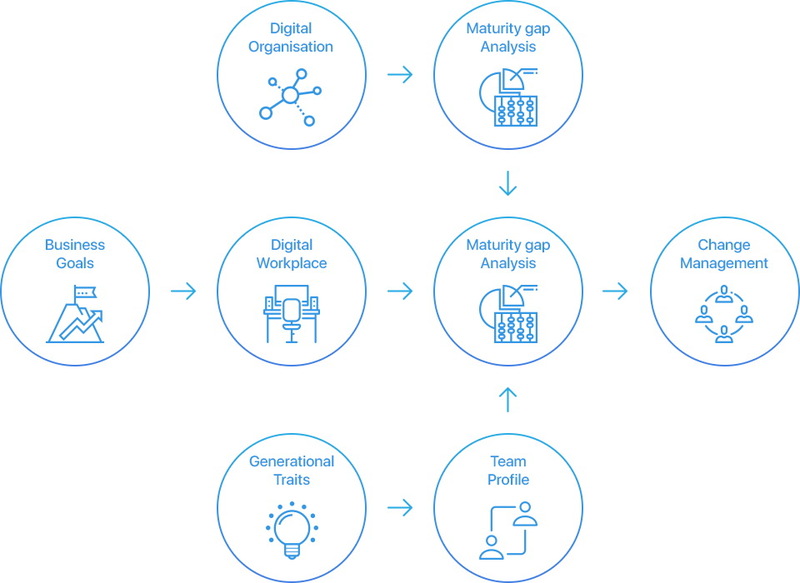 Now we consider Employee/Stakeholder Types as they relate to the organisations Digital Maturity currently and target Maturity to achieve performance goals. We consider each Employee Types, so that change can be managed to optimise outcomes for each individual in the Digital Workplace. The key premise is that One Size Fits All will lead to sub-optimal outcomes when we consider current employees and stakeholders as well as new entrants. We need to understand and plan for at least 5 Employee Types. Generation Z: Born from 2000+ (iGen or Post millennials’). Table A, below is a summary of the characteristics of each of the generations and therefore is useful as a short guide to help understand generational differences. It’s important not to pigeon hole individuals, however it is useful to understand the groupings so that plans and change readiness plus interventions can be tailored to take account of differences. The generation will give clues to overall life experiences, values, and priorities held by the group. The age of the individual (and individuals in groups) will be an indication of where they exist in their life cycle, their personal life experiences and future expectations. To summarise in very global terms we can simplify into three groupings. These are our more mature and experienced stakeholders traditionally educated and employed. This group will have experienced the early outcomes of computerisation in the workplace and some will have been quite involved in the development of the foundation of Digital Revolution technologies and/or as early adopters. The internet came about as a result of this generation. Most will have adopted to some degree the latest Digital Technologies (Social, Mobile, Analytics, Cloud, Block Chain, Internet of things) but many are not immersed in these technologies. Their current age profile and life cycle, is closer to the end of their careers than the start of them. These groups learned and adapted their behaviours to accommodate or leverage technology. For these generations, the electronic calculator was a major step forward. These generations were focused on opening up possibilities for using technology and developing the underlying foundation technologies. Generation X is like a bridging generation when it comes to the Digital Workplace. This generation was central to the period of rapid change in technology and, learning to adapt to and adopt the emerging technologies. This generation has a link with the previous generation whose values influenced their learning, and the following generations whose learning was influenced by the new technology business environment (Digital Natives). This is the generation who worked in the pre-internet & SMACBIT (Social, Mobile, Analytics, Cloud, Block Chain, Internet of Things) environment and who also work in the current SMACBIT environment both leveraging and developing them. These are our younger generations, they are both current workforce members and our new entrants over the next period. They tend to be better educated than previous generations and wealthier than previous generations at the same age. Technology is integral to both their generational development and age profile, they learned with technology and their environment and social engagement influences their behaviours which have been defined in many cases by technology. They don’t know what its like not to have access to mobile computing, Internet, Apps, and technology in general. This generation has realised the possibilities technology offered to previous generations and has innovated in many ways around making many of the possibilities a reality where they create value. 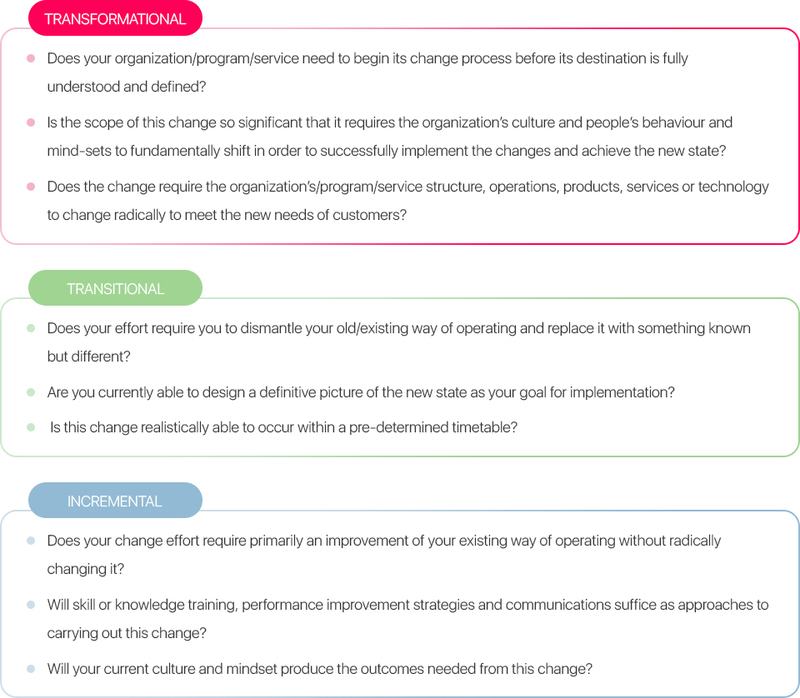 Table B, below outlines some of the differences in values between generations and influences design of change programs, management styles and digital workplace transformation. Our model helps organisations identify what they need to do to release innovation, leverage technology and transform performance we look at three key dimensions. Pervasiveness of Digital Technology in our organisations ecosystem: The extent either a function “Purpose” and/or Process “series of actions to achieve an end” are carried out without human intervention (Digitized) but serving stakeholders. The extent of the stakeholder Digital Experience. Culture adaptability “How we do things”, underpinned by beliefs, values, behaviours, rituals, symbols etc. The extent and impact of Innovation & Agile behaviours resulting from and self-enabling change. Cultural Maturity. Performance Level of the organisation. The level of accomplishment of a task or function relative to a standard , target or norm. The value of the organisation and to the organisation. Performance. If we understand where we are on these dimensions we can identify a more effective transformation and/or strategy to achieve our goals. Pervasiveness & Performance are self-explanatory, however, sometimes the importance of culture may not be as obvious. New ways of working are enabled by technology, new processes, new tasks, new skills (technical and soft), new products and services. The culture significantly influences the inertia in the organisation relating to change this will ultimately determine the speed and effectiveness of leveraging technology. The New Digital Organisation is more organic , more responsive and more agile, so stakeholder attitude and approach becomes more dynamic as regards the possibilities, opportunities and related actions. It’s more innovative and change is the norm. Culture is the intersect characteristic between the Digital Organisation and the stakeholder centric Digital Workplace. At the centre we aim to expand Advantage through enhanced Digital Maturity. Value is about the impact on performance from technology. Can they see the performance benefits and rewards from the use of technology? 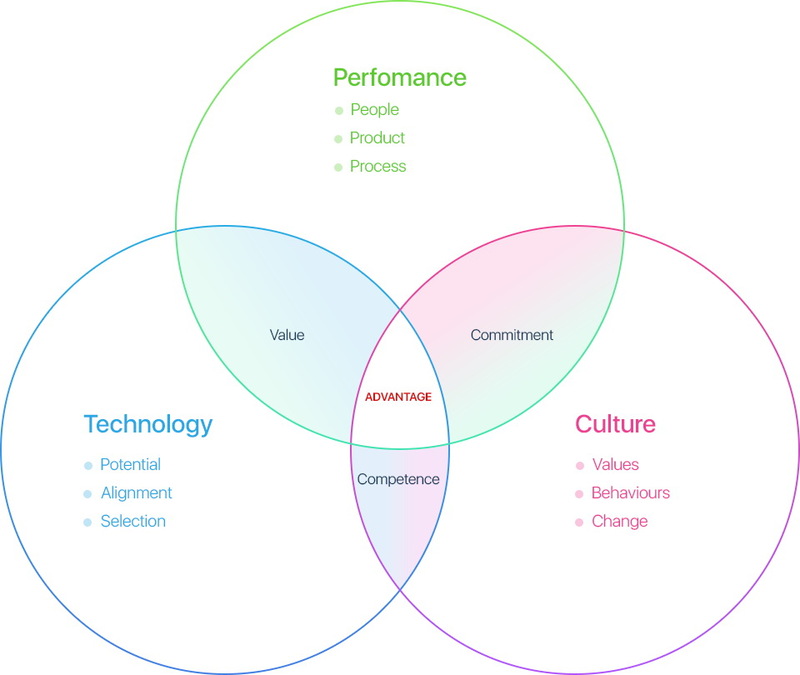 We can explore and understand the Digital Workplace for a stakeholder role and understand its maturity by targeting the three questions above at each to the key role domains. Activity: The planning, management, and execution of the tasks and activities relating to the role. Innovation: The capability, freedom and motivation to change and improve any aspect of the role. Resource: The ability, agility and speed to find use and share company resources, such as assets, information, materials, skills, expertise, men etc. Company Information: The ability to receive, fine, use and share all relevant company information in a timely manner when needed. Role: The roles itself, its definition, requirements, performance standards and in particular its deliverables whether they be tangible products or intangible services. Performance: The ability to measure , share, compare, target and improve the role product, process and Service indicators. The ability to participate in , control and own performance improvement for both the role and the individual in the role. Capabilities: The ability to understand and develop both the role (Function) capabilities as well as the individuals skills and competence to further improve outcomes and performance. Team/Group: The ability to engage, communicate and collaborate with role stakeholders in a dynamic and agile manner, assuring role and personal performance and satisfaction is maximised and also in support of fellow stakeholders maximising their performance formally and informally. 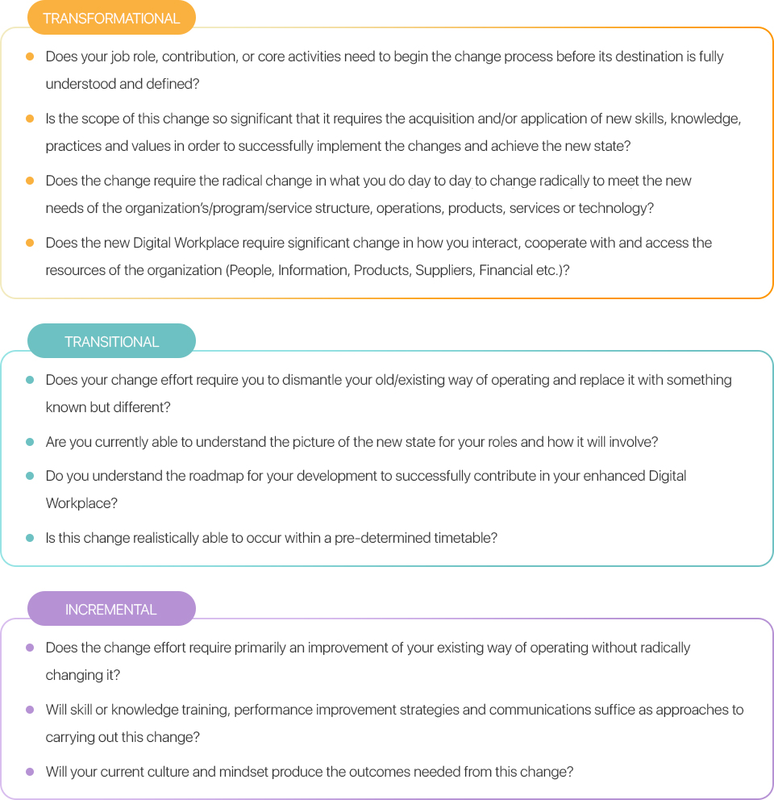 When considering change in The Digital Workplace we must maximise each individuals capability to engage and leverage technologies to maximise their performance and satisfaction individually and as it contributes to the organisation overall. Change impacts each stakeholder and their roles differently and is also influenced by their age and generation to some degree. The organisations Digital Agenda coupled with the profile of individuals and groups determine the approach to change and the supporting interventions to enable the business outcomes to be achieved. 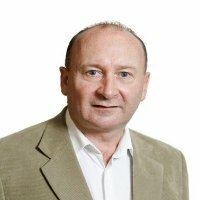 Declan is an International advisor and entrepreneur with over 37 years’ experience in technology related business. He graduated in Engineering in 1979 and worked with several multinational ICT related organizations rising to CEO level and acquiring an ACCA & MBA along the way. He jumped into the entrepreneurial world as a consultant in 2000 and founded his own successful software services company in 2003 which was acquired by Capgemini in 2008. His work today involves advising and supporting technology and technology enabled organizations with strategy development and execution. Over his career he has had significant experience in change management as it relates to the organization and individuals, these included, starting, scaling, merging, demerging, rightsizing, turnaround and transformation of organizations and their performance. Much of his current work relates to “Digital Business & Workplace” performance transformation and improvement. His home base is Dublin, Ireland and his client base spans the globe, he is also author of “Advantage – A Roadmap for entrepreneurs and leaders in the Digital Age”.